TIME FOR REGISTERING: 3PM UNTIL 8PM IN THE MARQUEE LOT, CONTINUING SATURDAY FROM 7AM UNTIL 10AM. If your planning on Cart racing or partying on Friday evening, it may be a good idea to get your car registered on Friday. 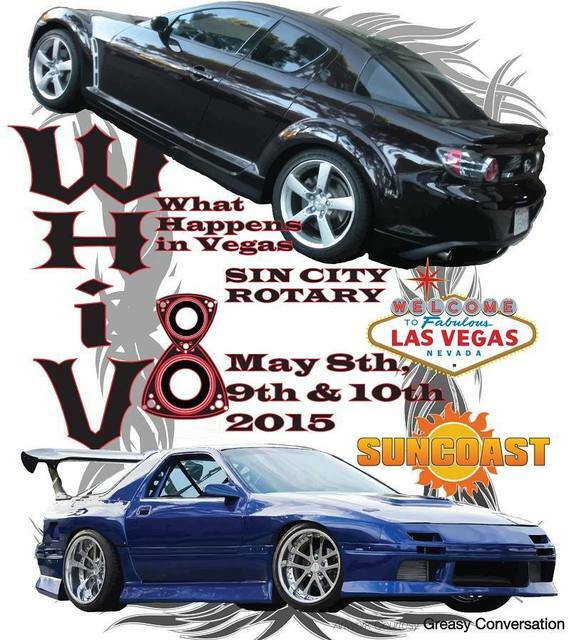 There will be several categories depending upon the cars registered prior to the event. Repus, old school, 7's and 8's will be judged separately. 7s may be broken up into fist, second and third gen vehicles if preregistration shows a sufficient number of vehicles. All registered rotary vehicles will be eligible for trophies. Last edited by Phil's 8; 04-21-2015 at 12:49 PM. Last edited by 13x; 04-03-2015 at 12:35 PM. Why the short notice? April 7th is 3 days from now. room reserved, for sat. night. Won't be at the hotel but will be attending this year!!! See ya'll in May. Countdown...less than a week away, woot woot! Trying to get a SOCAL LA/OC Caravan together. Leave Friday at 9 or 10am. Army fucked me over at the last minute. Sorry I can't join you guys. Phil and 13X killed it again this year with the raffle prizes and the parties. Thanks for putting on a great weekend for us! another WHiV weekend of memories ... onward to 7stock ! @13x Any news on WHIV9? I can't believe it's been, what, seven years since I've seen you guys! Everybody in Vegas still doing OK? Hi Phil, good to hear from you again, sir! The club up here died about four or five years ago. What was left got folded-into the local rotary club. They are on Facebook now, but I don't do Facebook so have no idea what's going-on with them anymore. But the days of the 8 have come and gone. It was incredible fun while it lasted, now it's just me and my 8. SLC Rotary is still going strong. We actually have a BBQ happening this Sunday 6/12. You should come join us! I've added an 8 to my collection now. I only get on facebook to keep involved with the car events. Well I guess I missed the BBQ Shep, since I haven't been on here since June 1st. Maybe next summer. Still don't do FB though.